N 93 & N 93i are 3G, multimedia cell phones, launched by Nokia sometime back. To know more about Nokia N93 & N93i mobile phone, check out their review as well as features given below. Nokia N93 & N93i, amongst the best 3G smart phones to be launched by Nokia, seem to be the big boss of most other multimedia phones. With all the latest features, namely 3.2 megapixel camera, 3X optical zoom, WiFi support, DVD-like video capture, Symbian operating system and E-mail capability, these mobile phones surely boast of power packed performance. They have the latest twist and rotating screen that further add to their stylish look. The only difference between the two is that N93i is sleeker, lighter and faster than N93. At a price of Rs 37,500, Nokia N 93 & N 93i are definitely value for money. 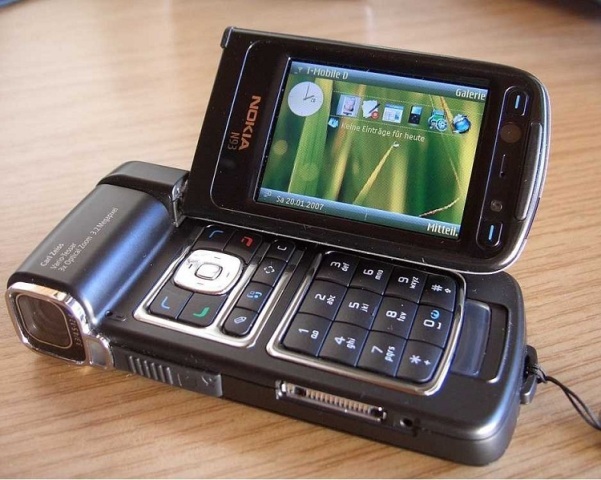 The flap design of Nokia N93 & N93i, with twist and rotating screen, definitely lends it a smooth and elegant look. With dimensions of 118 x 55.5 x 28.2 mm and weight of 180 g, N93 is the perfect companion for the ‘tall, dark and handsome’ guys. Those who want a slimmer, sleeker version should go for N93i. The phones have a big screen that helps them in working perfectly as a mini-camcorder. The 1.1-inch external LCD boasts of 65,536 colors, at a resolution of 128x36 pixels. The only problem is that they don’t have external buttons for volume control. All in all, the perfect tool for the style conscious people. The 3.2 megapixel camera of Nokia N93 & N93i comes equipped with a Carl Zeiss Vario-Tessar lens and 3X optical zoom. Serving as a mini-camcorder, it can record MPEG-4 VGA video of up to one hr, at up to 30 frames per second. There is also a secondary VGA camera above the internal screen, which can be used for taking photos and video as well. The clarity of the photos, along with the video recording, is very good. You even get an option to choose from four different photo qualities & six shooting modes. So now, you can ensure that not a single memorable moment of your life goes by without being captured. Those who are purchasing N93 or N93i to use it for office purposes will not at all be disappointed. The Symbian OS 9.1 incorporated in the phones ensures that you get much more than the basic PIM capabilities. They support HTML/XHTML web browser and come equipped with e-mail capabilities. You can also view (not edit) MS Word, Excel, PowerPoint and even PDF files on them. The mobile phones also support SMTP, IMAP4, and POP3 accounts, with full attachment viewing and mobile VPN support. The music lovers can rejoice. Nokia N93 & N93i comes with an in-built music player that supports MP3, WMA, AAC, AAC+, and eAAC+ files as well as OMA DRM 2.0- and Janus DRM-protected songs. They also have FM radio & the memory is expandable up to 2 GB, which means that you can now carry your favorite numbers as well as photos with you all the time. The phones also have an onboard RealPlayer, with 3GPP and MPEG-4 video-streaming support. With these cell phones, the music in your life will never go away. The other basic features of Nokia N93 & N93i include Bluetooth (version 2.0), Wi-Fi and Infrared Port. They run on both 2G (GSM 900 / 1800 / 1900) and 3G network (UMTS 2100). The mobile phones, which come with MIDEP 2.0 Java and UPnP Technology, are available in two colors - Black and Silver. The Li-Po 1100 mAh battery promises a good talktime as well as standby time. With Nokia N93 & N93i, you can work, play, listen to music and capture the beautiful moments of your life!